LIMITED ONE TIME PRODUCTION Megabass listened to the valued input from anglers and ramped up production for some of the highly sought after Vision Oneten colors responsible for a tremendous amount of tournament winnings. Don't let these hard to get colors get away! 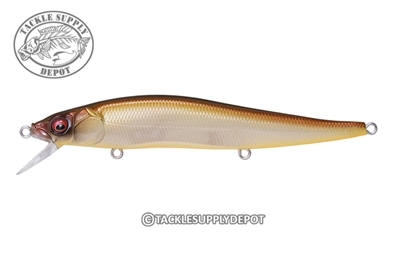 Once the closely-guarded secret of the pros, the Vision 110 has quickly become a staple among professional and amateur anglers alike, setting the standard for jerkbait fishing in all U.S. waters. The profile, one-of-a-kind darting action, balancing system and realistic color patterns all contribute to the incredible fish-catching ability of the Vision 110. The tungsten Multi-Way Moving Balancer System (PAT) not only fuels the 110's unparalleled action and huge flashes, but also allows the Vision 110 to cast like a bullet. This deadly package is finished off with three Katsuage out-barb treble hooks, designed to increase hook-setting percentages when power-bait fishing. The Vision 110 excels when the water temps are between 38 to 70 degrees. During this time (especially from November to April in most U.S. waters), the Vision 110 is an excellent choice when fishing points, flats, rocky banks, bluffs, or over underwater grass beds. However, the Vision 110 can also be deadly around boat docks in the heat of the summer. Smallmouth anglers will find no better lure that the Vision 110; in Northern waters, smallmouth bass will attack this lure from spring to fall. The wide range of colors available for the Vision 110 make this bait effective in virtually all water clarity conditions, but the Megabass Pro Staff has found the 110 to be most effective in water clarity from 1 to 20 ft. The Vision 110 is at its best when fished with Megabass Dragon Call line in tests of 6lb. to 15lb. Line size will affect the depth the Vision 110 is able to reach, running about 6 ft. deep on 6lb. test to around 4 ft. on 15lb. test. Megabass suggests fishing the Vision 110 on the following Megabass rods: Tomahawk F4-70GTA, Orochi F4.5-70X4 or Orochi Jade Python F4-74XS. Each of these models will allow the Vision 110 to live up to its fullest potential and increase overall effectiveness. Try one of the Vision 110's out on your next trip, and find out firsthand the magic of this lure.